Hi Ellie, thanks for joining us! I just finished Hounded and Hounded2 and you made the zombie world your own personal playground. Both were so well-done and truly had an original edge to them, especially considering you approached it from the aspect of man’s best friend becomes a killing machine. 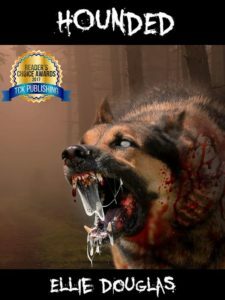 Is there a story behind your choice of zombie dogs? Do you have dogs? I know I’d be shattered if our sweetheart of a dog, Jimmy, turned into a zombie. What attracted me the most about Hounded is how detailed it was and yet your story doesn’t get bogged down in the details. The story’s flow is smooth. You write like a seasoned professional. How long have you been writing and how did your path lead to zombies? And do you want to tell us about your current WIP? ED: Hounded was the first book that I completed and it took me just shy of one year to write it. Initially, it was one book, which I had to separate into two books. So, officially, I started writing in 2015, however, I have been writing for most of my life. Yes, I am working on something, and I’m going to be very mysterious about it. Because it is another idea that hasn’t been done before and so I want to keep the lid tight on it so it will be more of a shock-surprise when I release it, which will be sometime in 2019. I checked out your website, so very cool. I love the dark, mysterious ambiance. I also love the way you describe New Zealand and its accomplishments. It makes me want to live there! So, when you’re not writing and raising your four kids, tell us something special about New Zealand that you enjoy doing. 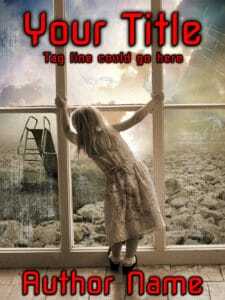 Ellie, what led you to become a writer or even interested you about the horror genre? ED: I often ask myself, why did I want to be a writer? When I was a little girl my dream was to be an actress. 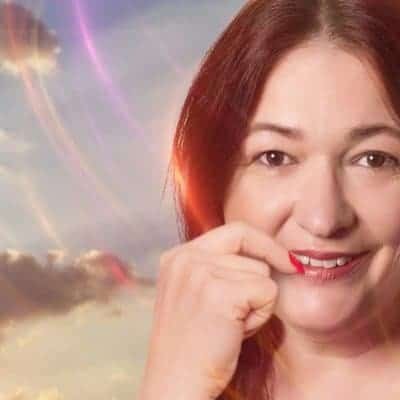 However, living in New Zealand and growing up in the ’70s and ’80s there wasn’t much in the way of acting and one would have had to travel abroad. Instead, I transferred that dream into one I could do which was write. I love writing down stories, in particular, short stories. When my kids were babies and then toddlers I would not only read them stories, I would also make up stories. They loved them. The giggles I got from them were insane. For a while, I thought I was going to be a children’s author. But the passion for horror overrode that as the children grew older. I hate to be cliché or ask what everyone else asks…but in truth, all these things interest me as a reader. Do you live in Auckland or in the bush? ED: I live in Auckland and I’d never live in the bush because I’m a wuss when it comes to bugs. LOL I hate the weta’s we have here. There are far too many bugs in the bush for me. However, we are surrounded by bush and I love taking bush walks. The kids love them, too. Please tell us about Fear Inducer and your other stories and what inspired you to write them. ED: Fear Inducer came about from somewhere deep inside of my mind. I wanted to create a complex character that could be both evil and nice. One that could commit murder without touching his victims. I thought about many ways to do this and came up with Fear Inducer. Felix, the main character, is an award-winning psychiatrist and psychologist. He was the prodigy of his parents, due to them having performed brain surgery on him, many times throughout his first years of development. In the hopes that he would be the world’s smartest man. This was his parents’ hope and dream. They succeeded. However, an accident occurred during one of the routine operations, and it caused Felix to dive very deeply into his dark side. He couldn’t stop the desire to murder, no matter how much he wanted to. So Fear Inducer was born. As for inspiration, it was more a challenge than an inspiration. 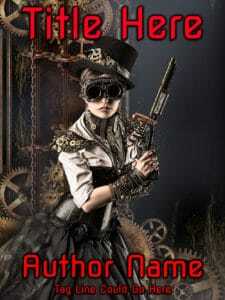 I wanted to see if I could write a character so intelligent and so murderess at the same time. Which I did successfully. He is loved and hated by the many who read that story. My other stories/books; again I never really have the inspiration to create them. I have thoughts that challenge my mind into writing something that I hope no one else has. I like to be different. My books touch on character levels, getting to know the characters is exceptionally important for me. Without a bond with the reader and the character, you have nothing but a bunch of words. So I ensure that each time I create a character that he or she will either be loved or hated. So my stories always start with the building of a character, their personality, quirks, loves, hates, tastes in music, etc. all of it laying the foundation for the story to unfold around them. I get into the minds of my characters and like a ladder, I climb them molding stories around them. I noted on your website your awards. Please tell us about them. ED: I never in a million years thought I’d win a book award, let alone four. I submitted my books to New Apple, Readers Choice, Literary Titan, and Greenlight Screenplay Adaption. 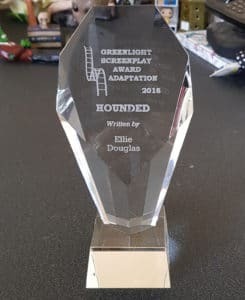 I received a large, beautiful crystal trophy from Greenlight and it is simply gorgeous and a true honor to have had my book ‘Hounded’ engraved on such a prestigious award. The same for all the other awards. For an indie author, it gives a new light of acknowledgment that our work is greater than good. Such compliments as those are very confidence boosting. I suggest all authors reading my post submit their works to contests because the reward isn’t winning, it is the recognition which in itself is an enormous win. And your graphics business, I’d love to hear about that. Did you create your own covers? How long have you been a graphic artist? I’d love examples of your work. Pre-made covers? ED: Thank you, Ingrid, and thanks for this interview! In closing, thank you so much, Ellie Douglas, for the wonderful interview. And readers, we’d love to hear from you. Please contact Ellie using her links above or feel free to comment below. And, if there is a certain Indie Author you’d like me to interview. Please nominate the book and author in the comment section below. If I enjoy the book as much as you obviously have, I’ll be sure to interview the author. Thanks, Frank, appreciate your comment and suggestion. Thanks for reading!